Each year, the Maryland Horse Council honors one Maryland horse person with the distinction of Horse Person of the Year. The honor not only recognizes an outstanding individual in the Maryland horse community, but an outstanding Maryland horse person who has made a career in the horse industry and influenced the industry in a lasting way. Beverly Raymond, who recently retired from her job as the state stable inspector, is a prime example of an individual who not only made her career within the Maryland horse industry, but has left an indelible mark on nearly all aspects of the Maryland equestrian community through this career. Beverly was a model civil servant. She embodied the ideal on which our government is based: that the function of government is to serve the public. When our society created public services, it was with the idea that these services would be carried out by individuals like Beverly. But Beverly was more than just a model civil servant. Through her work as the Maryland state stable inspector, Beverly was able to harness her passion, horses, to improve the lives all of horses and horse people in Maryland. Through her work as the Maryland state stable inspector, Beverly was able to do what most of us only aspire to do: merge our avocation with our vocation. Beverly was more than just fine; as she grew older she rode whatever anyone was willing to let her ride. “I’ve broken all kinds of bones through the years but I learned a ton while doing it!” Mucking and grooming to earn ride time, Beverly learned by watching the “pros” and by doing, lessons she repeated for others during her tenure as state inspector. In the 1970s, Beverly’s family decided it was time for them to buy their own horse farm. They found Orwell, a historic farm with a home that was originally built in the early 1700s. “Some of the places we looked at had great houses but the pastures weren’t so good. Then we came to Orwell and we all thought it was perfect,” Beverly commented. Beverly opened her new farm to a few boarders and it grew into a riding stable complete with a few invitation-only shows. “We had Jim Mooney come and teach here for a while. He was just great and would judge the shows too. He judged them as if it were a clinic, telling everyone how each class was judged and why he pinned each class the way he did,” she said. The farm was perfectly situated at the edge of Gunpowder State Park, with direct access to over 100 miles of trails. “Some of my boarders called me the ‘trail nazi’,” she laughed, explaining that when the footing was not ideal she was a stern taskmaster. “Some people feel they can just ride anywhere at anytime. That is how trails erode and why other trail users don’t like horseback riders,” she added, a life lesson she used as a founding member of the Volunteer Mounted Patrol. The experiences she had as a stable operator more than prepared her for life as a stable inspector. “I dealt with all kinds of people and boarders,” she laughed. She even had a group of working students who really did not do much work. “Some say I was just too nice, but I really wanted to give others the same opportunities that I had growing up,” she said. Eventually, however, Beverly realized that running a stable was probably not the right career choice for her. “I’m not one of those people who should run their own business. I give everything away and I’m just too soft-hearted,” she stated. It was time for a change. Beverly feels that the job of state stable inspector was “gifted” to her. “These sorts of things never would happen in today’s world,” she said, smiling. Beverly’s longtime friend Robin Allison had been working part time for the Department of Licensing and Regulations as a stable inspector, but needed a full-time job so she called Beverly up one day, told her she was going to resign and asked Beverly to come with her and interview for the job. So Beverly stepped into the role as stable inspector under the State Board of Inspection of Horse Riding Stables, which was founded for the purpose of ensuring that horses in public facilities received a certain minimum baseline of care and that the equipment and facilities met a basic minimum standard of safety. “I was the only stable inspector at the time. I did the whole state. Some days I’d spend the whole day at one stable, other days fit in a few,” she explained. Most were hack stables that rented horses by the hour. That steadily changed over the years to become more and more lesson stables. “It has been fun to ride that wave of change!” she enthused. “It was always the intent of the creators of the State Board of Inspection of Horse Riding Stables (now the Maryland Horse Industry Board) that this be an outreach program, to help educate those who were not in compliance and support their efforts to bring their facilities and husbandry into accepted standard practices. It was never the intention that inspections and licensing be a punitive process,” said Equiery Publisher Crystal Kimball. Beverly agrees fully and felt her role was not to just enforce rules, but to help others run their businesses better. “I wanted to help people avoid the same mistakes I made when I ran my own stable,” she said. She had her own way of doing things, too. “I would drive in and first just take in a general look of the place. But really, when it comes down to it, the horses tell you what the place is like,” she said. “I sort of learned what to do as I went along,” she added. “Beverly has been the embodiment of education and outreach, working with stable owners to better improve their understanding, and help coach them into compliance. Her role as state stable inspector was not just a job, it was a mission,” Crystal Kimball added. Elizabeth Madlener had just bought the Maryland Horse Center, Inc. when she first met Beverly. “At the time, I was feeling pretty overwhelmed trying to organize such a huge horse center. Plus I was trying to handle all the demands being made by my landlord, Maryland-National Capital Park and Planning. When I was told of the impending inspection, I groaned and had visions of dealing with another bureaucrat who would pull out more hoops. But Beverly wasn’t that way. She was sympathetic and her suggestions made sense,” she said. When Beverly first become an inspector, the Board was still housed under the Department of Licensing and Regulations and shortly, the law that created it was up for review by the Maryland General Assembly, which meant that Beverly did not know if she would still have a job at the end of the 1978 legislative session. Not only did she still have a job, but the legislators turned it into a full-time job when they relocated the Stable Inspection Board to the Maryland Department of Agriculture, laying the foundation for the Board to metamorphose into the Maryland Horse Industry Board in 1999. The mission of the new MHIB included not only the old mission but also the expanded responsibility to market and grow the horse industry in Maryland, as well as to help preserve and promote the historical and cultural significance of horses in Maryland…something Beverly had been doing her entire life. And sometimes, it can get dicey! Beverly can tell you countless stories of good stables and bad ones. Stories of people who opened their homes to her and others that told her to leave the property. “You need to know how to keep your cool when dealing with difficult people,” she remarked. Former MHIB Executive Director Rob Burk added, “She always found a way to break through. She saw her role as helping facility operators improve their business.” But the stables that stick out the most in her memory are the ones who openly took her advice and truly improved their businesses. She recalled how one stable looked great, but the owner was struggling to make ends meet. The owners were hosting events just to make enough money to pay for winter hay. “I made a few suggestions about raising her rates and getting rid of the self-care boarders and told her about several conservation funds they were eligible for,” Beverly explained. The following year, when Beverly pulled up the farm drive, she was astounded by what she saw. “They did everything I suggested. It was like ‘wow!’ That kind of thing was really rewarding,” she said, smiling. “Beverly is a dream. She helped the people just as much as she helped the horses. You can’t find a better person than Beverly,” stated Jim Steele, current chairman of MHIB. Eventually, the role of stable inspector got too big for one person, and a second stable inspector was hired. In the process, MDA attached inspecting vet hospitals to Beverly’s responsibilities, thereby ensuring that both inspector positions could remain full time. Beverly was already a certified vet tech, making her, once again, perfect for the position she was being recommended for. “Everything in the Maryland horse industry has Beverly’s fingerprints on it,” commented former MHIB Executive Director Rob Burk, referring to the sport and pleasure horse (nonracing) segments of the Maryland equestrian community. Beverly understood that the mission of MHIB was to promote the generic horse to the general public and to help foster and grow the horse industry in Maryland. But before there was an MHIB, Beverly had dedicated herself to this cause…and, in many ways, because of Beverly, it now exists. Established in 1985, with Beverly as a founding member, the Maryland Horse Council (MHC) was created to unify, inform, and represent Maryland’s diverse horse community. As the industry’s state legislative representative and trade association, MHC protects and promotes the horse industry by providing a united voice in the Maryland state legislature and state agencies, by interacting with the media and the general public, and by keeping its members informed on issues that affect them and their horses. Beverly saw a need for the Maryland horse industry as a whole to have a voice and representation in the state legislative process. “The pleasure horse people just needed a voice,” explained Beverly. “There was a need for an independent, statewide horse organization that would unify all the various and diverse segments of the equestrian community, from racing interests to trail riders. Beverly saw this need and was dedicated to building bridges between government agencies and private citizens,” explained Crystal Kimball, who served as secretary of MHC for 15 years, from 1993-2008. Always willing to do the tasks no one else wanted to do, Beverly operated as cheerleader when interest waned, as chair and organizer of whatever committee needed her, and as treasurer for six years under the presidencies of Rich Wilke, Elizabeth Madlener and Malcolm Commer. Quiet, and always maintaining a low profile, Beverly planted the seeds that today have blossomed into such mainstays of the community as the “Maryland Horses With Pride” booth at the State Fair, the Volunteer Mounted Patrols, the Maryland Association of Equine Rescues & Sanctuaries, and—of course—the Maryland Horse Industry Board. “As Beverly continued to provide copious amounts of food at various Maryland Horse Council meetings, I also experienced first hand her incredible knowledge of the horse world, heard many astute observations and suggestions on how to improve this same horse world, and was constantly reminded by her grace, wit and gentle suggestions that people can make a difference without having to shout, stamp their feet or force their presence on others,” said LuAnne Levens, owner of Perriwinkle Farm and former MHC president. Through her work with MHC, Beverly was also on the committees that created brochures for trail etiquette, minimum standards of care and information on what new horses owners should know before they buy a horse. “I am particularly proud of those brochures because so many people use them still today,” Beverly commented. Since its founding, MHC had been under tremendous pressure from the equestrian community to act not only as a lobbying force but also as a marketing and promotional force to grow and develop the horse industry. Realizing that it had neither the funds nor the internal structure to effectively market the industry, MHC began looking at how other agricultural commodities were able to effectively market and grow their industries. The prevailing mechanism seemed to be to create a commodity board within the Department of Agriculture from the ground up…but it was a daunting task. Beverly, who was still serving on the MHC Executive Committee, seemed to have the perfect solution: expand the mission of the existing State Board of Inspection of Horse Riding Stables and change its name. Voila, the perfect solution! Of course, nothing is easy in politics, and the Horse Council’s first attempt to convert, via legislation, the Stable Inspection Board into a broader Horse Industry Board met in failure. So, MHC regirded its loins, hired a lobbyist, and in 1998 succeeding in passing the legislation that transformed the once modest State Board of Inspection of Riding Stables into the Maryland Horse Industry Board—thanks in no small part to Beverly. So, now there was a big board with a big mission—and no funds and no employees other than two state stable inspectors. While MHC got busy trying to find a funding source for MHIB, Beverly got busy running the new organization, virtually in a volunteer capacity on top of her increasingly heavy load of stable inspections. From 1998 to 2003, Beverly served as the unofficial executive director and executive secretary, managing the administrative and communication needs of the growing board. This included organizing and facilitating monthly meetings (often cooking for them as well) and setting up and staffing MHIB promotional booths throughout the state (including every day, all day at the Maryland State Fair), as well as recording the meetings and producing the minutes. “It is an understatement to say that MHIB would not have accomplished all that is has, to date, if it were not for the dedication and energy of Beverly,” stated Equiery publisher Crystal Kimball. Beverly worked closely with MHIB’s first chairman, Greg Gingery, to create the MHIB Grant Program. “It is always fun giving away money!” laughs Bev. Through her various roles on various committees, whether paid or unpaid, Beverly has made an indelible mark on the Maryland equestrian community. Beverly was a founding member of the Maryland Association for Equine Rescues and Sanctuaries (MARES), which started as a subcommittee of the Maryland Horse Council. Through her work on MARES, she helped to raise the acceptable standards of care provided by rescues and sanctuaries. She helped bring them into the state stable licensing program. Beverly helped to codify the MHC’s interpretation, used in courts throughout Maryland, of Maryland state law requirements for the minimum standards of care for equines. This document has helped numerous courts throughout Maryland sift through charges of cruelty and neglect, to determine which charges are legitimate and which were simply harassment. Beverly has also played a critical role in the development of the Professional Animal Workers Society, specifically improving the equine education of animal control officers in all of Maryland. “She came to every meeting,” said Nicky Ratliff of the Carroll County Humane Society. “It was very positive to have her there. She would give our concerns to MDA and helped us with all kinds of issues. She was right there with the people making the changes,” she added. 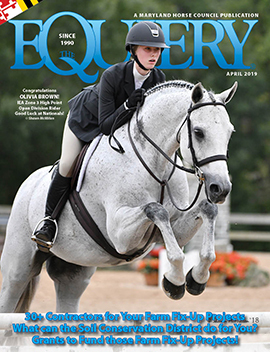 Beverly helped spearhead the equine industry’s formal interpretation of Maryland’s Code for “Minimum Standards of Care for Equine.” She brought this issue before MHC and after a year’s worth of debate, over 30 horse organizations, representing almost every conceivable sport and breed, agreed to and ratified an industry interpretation of the State Code. This MHC interpretation is now used as the basis for determining cases of neglect or abuse. When it came time for MHC to lobby for a funding source for MHIB, Beverly played a key role in helping stable owners understand how and why the feed funds would be used. Beverly defined the role of the modern state stable inspector. She knows it, and it pleases her, because it means that the modern state stable inspector treats the position as it was intended, as that of an advocate and educator, not of a judge and jury looking to penalize. Beverly is likewise proud that she was a founding member of MHC, just as she is proud of her work with the Volunteer Mounted Patrol, MHIB, and the countless other committees she has served on. “It was great to be part of something that would allow us to put a pulse on the industry, to get better regulations. It was quite a journey and I loved it!” she added. In the summer of 2010, after 32 years, Beverly made the very difficult and emotional decision to retire. Of course, for those who knew Beverly, she had been threatening to retire for years! But, as Beverly explains, her role in improving life for horses and horse people, well, “it was all kind of addictive!” explains Beverly. “I never got tired of going to places and seeing all the horses and barns, but I’m almost 72 and it is time to do something else. I spent my last year as stable inspector saying goodbye to all the stable owners I have met,” explained Beverly. “I have no regrets and would absolutely do it all again!” she added. In December 2010, Beverly said her last goodbyes as a state stable inspector, and in 2011 stepped off the numerous boards and committees on which she served as a volunteer. And she spent most of the past year doing what, well, most horse people always seem to be doing: fixing up the farm! But on the evening of Saturday, February 11, 2012, Beverly will be back to be honored by the Maryland Horse Council as the Horse Person of the Year…but is Horse Person of the Year really enough to capture all the Beverly was, is, and means to the Maryland horse world? No, not it is not. Maryland Horse Person of the decade, maybe? Or the century? Without a doubt, Beverly Raymond is the first lady of the Maryland horse world. “I first met Beverly Raymond while attending a Maryland Horse Council meeting during a Maryland Horse World Expo some time ago. The meeting was held in a section of the Cow Palace and at the conclusion of the meeting, Crystal (then Brumme) Kimball announced that there was fried chicken for all, provided by a Beverly Raymond, and urged us to dive in! I though, how nice, some gal who is a homey kind of person has cooked up a feast. It was good! Only later did I learn that Beverly was connected with the Maryland Department of Agriculture and had probably been inspecting my own barn for years. Because I worked off the farm at other professions, my farm manager was the one to have direct contact with her. “As Beverly continued to provide copious amounts of food at various MHC meetings, I also experienced first hand her incredible knowledge of the horse world, heard many astute observations and suggestions on hot to improve this same horse world, and was constantly reminded by her grace, wit and gentle suggestions that people can make a difference and they don’t have to shout, stamp their feet and force their presence on others. “Those bags of feed she carried on her rounds to help someone who might need them, her attention to horse rescue, her alertness to those who might need her… she has shown, not talked or bragged about, what true compassionate care is all about. privilege to work with her. “Beverly always showed a genuine concern for the horses as well as the people who loved and cared for them. She was knowledgeable about the issues and challenges facing the horse industry, but she never lost her optimism and good humor. She has been a strong and steady advocate with the grace of a lady. “Please tell Beverly ‘Thank You’ for a job well done! I was the director of the Humane Society of Kent County from 1987 to 1999. I met Beverly during that time span and have thought of her often over the years since I left the Humane Society. Especially every time I read something about MHC and all the happenings. I had just bought the Maryland Horse Center, Inc., when I met Beverly Raymond. At that time I was feeling pretty over-whelmed trying to organize such a huge horse center, one that had lost money for years, was hated by the surrounding community, and not well regarded by the larger equestrian community. Plus I was trying to handle all of the demands being made by my landlord, Maryland-National Capital Park and Planning. When I was told of the impending inspection, I groaned and had visions of dealing with another bureaucrat who would pull out more hoops. But Beverly wasn’t that way. She was sympathetic and her suggestions made sense. It wasn’t long before my and Beverly’s paths became more strongly intertwined. I joined the Maryland Horse Council and became secretary. Beverly was already a member and became treasurer. Then I was nominated for and became president. Beverly continued as treasurer, and Crystal (then Brumme) became the secretary. The three of us worked closely together to shape the Maryland Horse Council and to develop it into the organization it has become today. Beverly was always very level headed, always strong in her beliefs, tenacious but gentle in the way she presented her ideas. She was an invaluable resource of information on the doings of Maryland horse people because she was out and about as an inspector. Beverly also brought great, intuitive insight about the people she got to know in her travels. She gave us good ideas for working with the various personalities. One of Beverly’s passions is trail riding. She not only knows the trails, but spent hours with other trail riders, grooming the trails for future use. She helped us structure the Greenways and Trails Committee. Much of the organization of the Welfare Committee came from Beverly’s suggestions and helped make it into one of the Council’s strongest committees. We were aware of but not so much as was Beverly of the potential threat of the animal rights groups that were growing in strength and voice. And just as an aside, in addition to the group thinking, planning and implementation of many of our early strategies, Beverly always made sure that we didn’t go home hungry from our long meetings. Beverly has fabulous culinary skills and somehow found time to treat all of us to fantastic repasts, just another sign of her indefatigable generosity. Beverly Raymond has always been the quiet “doer” in all the events she and I have been involved in. She did miracles helping us set up the first 4-H auction, organizing the Horseman of the Year Awards ceremony, the Youth of America Ride On! Evening at the Equestrian Center, the Legislative Day at Maryland Horse Center, helping with the equestrian events in President Clinton’s first inauguration, planning lobbying efforts in Annapolis, and on and on as well as so much of the behind the scenes work to bring publicity of the horse world to non-horse people. She’s given so much time to other people that I wonder if she’s not secretly a cat on her 20th life! To her very core Beverly loves the horses. She loves to smell them, be around them, champion them, and she knows more about them than most people, even those horse people who present themselves as the “experts.” She loves to ride but her generous heart often led her to ministering to lame or unwanted cripples so too much of her time was taken up with being a caretaker and not a rider. Beverly also loves to paint and has been recognized for her talent on canvass. But, as the years passed her painting became more and more a tomorrow thing. Now, though, now maybe as a retiree she will have the time to ride her horses and fill up her days with the painting and with all the things that she put on the back burner while she took care of everybody else. In any case I can think of no one who has given more to Maryland and her horses nor anyone who has been more vital in nurturing the growth of the Maryland Horse Industry nor anyone more unpresuming in her generosity than Beverly Raymond. In congratulating Beverly tonight, I know we all speak from the heart. While I am fortunate to have made many wonderful friends during my eleven years of living and working for the horse industry in Maryland, there aren’t very many for whom I would seriously consider driving 22 hours in a single weekend just to attend an event in their honor. However, you are most definitely one good friend for whom I would do it, and I regret that there was simply no way that I could be there tonight. In my judgment, no one could deserve this recognition more. I believe that very first meeting of the Maryland Horse Council that I ever attended was in about 1986, somewhere around Upper Marlboro. I remember faces, although I can’t put names on every one in that tiny, loyal band that had kept the organization alive. But I distinctly remember that YOU were there – you had brought a cake and other refreshments (as you so often did) – and I recall thinking that your optimism was contagious. In the decade to follow, the Council underwent significant changes in its structure and bylaws in our effort to have it become a more effective and more representative organization. As the Council changed, some of the people involved also changed. Those who preferred the old structure sort of fell by the wayside while those who believed in the new emphasis began to be more active. Yet, the one constant presence throughout those years at every meeting of the Maryland Horse Council, whether held in Upper Marlboro or Timonium, was Bev Raymond. No one was ever more loyal to the organization, more appreciative of everyone who gave of his or her time, and more trustingly open to different ways to move the organization forward in its effort to serve horse groups and horse people. The one other point I’d make is from my experience in Maryland as a member of the Agricultural Commission for six years and my current appointment to the Kentucky Equine Health and Welfare Council. The public awareness of animal welfare related to horses has risen dramatically since 1985, as has the involvement of both private groups and also state governments. Instances of tensions and accusations have also grown in proportion. In my view, you have been the model of how individuals in this field can be compassionate, knowledgeable and reasonable. Horses and horse lovers would be better served if there were more Beverly Raymonds. Congratulations, Bev. Thanks for friendship and all you’ve done.